If you've never heard SRS's sound enhancements, you're missing out. They add bass, depth, spaciousness, and clarity to just about any piece of music or video. 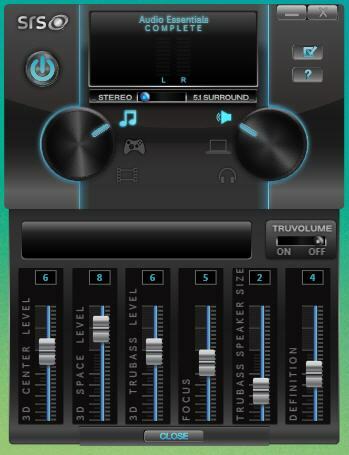 Bass-enriching TruBass and space-enhancing Focus and Definition (as WOW)are actually included with Windows Media Player, but if you use another player, you need SRS Audio Essentials, a free version of which is available that adds WOW and TruBass to any player and works with virtually any audio or video player. I use it with VLC, which I favor for its comprehensive format support. There doesn't seem to be a lot new in SRS Audio Essentials other than the name, a new look, and a new feature called TrueVolume. To all appearances, SRS AE is an updated version of the company's HD Audio Lab (though SRS Labs was quick to call it a new product when I asked about it). Whatever it is, it's better than HD Lab, whose interface was, to be polite, less than stellar. Audio Essentials' interface mimics the look of a stereo receiver and is far more logical and intuitive. I have only one complaint--the icons and text are too small for old fogies like myself. Kids will have no problems. The SRS Audio Essentials interface is friendly, and pretty, but also a bit small. The free version of SRS Audio Essentials handles two-speaker setups, provides the equivalent of WOW and TruBass and should be enough for just about anyone's needs. There are presets for music, gaming, and movies as well as desktop and laptop speakers which should also be fine for the average user. I did notice the occasional crackling on output, but this turned out to be having inadvertently selected 5.1 speaker output when I only have a 2 speaker system. The only new audio processing feature that I could find in SRS Audio Essentials, TruVolume, is available only in the $30 pay version, which also handles 5.1 speaker setups and provides a few other perqs. TruVolume is essentially a normalizer; i.e. it increases or decreases the volume of sound that's too quiet or too loud. All in all, I consider SRS Audio Essentials a must-download. If you use WMP for playback, you don't need it, but VLC lovers and users of other players should grab it. One warning: Sound enhancement can be addictive. Plain ol' playback may never again suffice.